Boca Grande Beach and Lighthouse is a 16" x 20" mixed media collage on canvas that is framed in black. 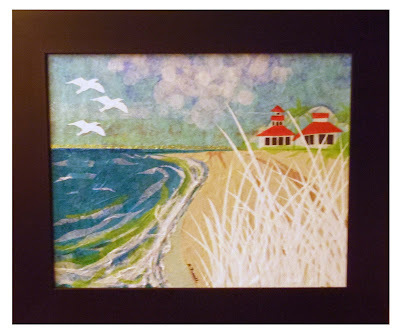 To create this piece, I added multiple layers of blue and white tissue paper to create the sky and clouds, then blues, greens and white for the ocean and ground cover, white for sea oat grass and seagulls, tan for sand, and a red roof for lighthouse. I topped the collage off with may colors of glitter to provide motion for the water. I then sealed the completed piece with a UV protectant. Boca Grande is located on Gasperilla Island in Florida, on the Gulf of Mexico. I have had the opportunity to visit this beautiful place and can understand Wilma's interest. Visit http://www.bocagrandechamber.com/ for information on this island. This was a Custom Order in memory of the clients mother, Wilhelmina, who recently passed. Her family says Wilma was an amazing woman and that Boca Grande Beach and lighthouse (in Florida) was one of her most favorite places. Wilhelmina Gronso, 95, of Dunlap, Tennessee, died on Tuesday, January 3, 2012. She was born in Kalamazoo, Mi., on October 21, 1916. Wilma moved with her family toAmsterdam, Holland where they lived for six years. In 1939 she married Peter VanDyken, Sr. who preceded her in death in 1965. In 1979 she marriedGeorge Gronso who preceded her in death in 2005. Wilma enjoyed her retirement years in Port Charlotte, Fla., and Dunlap. She was alsopreceded in death by parents, William and Dorothy Lucking; three brothers andone sister. 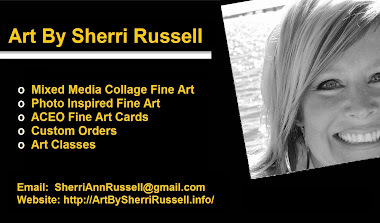 Email sherriannrussell@gmail.com for more information on custom orders.